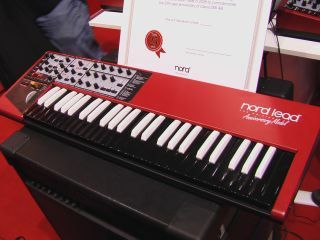 The Anniversary Model has the guts of the Nord Lead 2x but a design all of its own. Has it really been 25 years since Clavia came into being? Remarkably, the answer is yes, and to celebrate this milestone, the company is launching the Nord Lead Anniversary Model Limited Edition. Boasting the same specs as the Nord Lead 2x, this eye-catching synth has a custom printed front panel and an inverted colour scheme on the keyboard. Only 299 units will be made, so if you´re a synth collector, you might want to get your order in quick. As a further bonus, each Anniversary Model will ship with a certificate of authenticity signed by Clavia founder Hans Nordelius. We´re not sure how much this sure-to-be-sought-after synth will cost; if you´re interested in acquiring one, our best suggestion is that you check out the Clavia website and contact your local distributor.